As parents, we simply want to give our children the best. For most of us, this means sacrificing a lot of aspects in our lives, sometimes even our own happiness, just to make sure that the needs of our children are met. 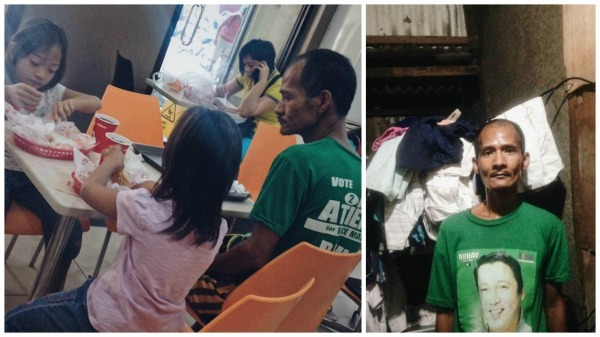 Ryan Arebyabo also known as Tatay Ryan “The Selfless Father” has earned praises from netizens after photos of him watching his daughters just eat at Jollibee went viral online. In the photos, Tatay Ryan was a picture of a selfless man who found contentment in seeing his daughters happy. The bittersweet scenario was photographed by a certain Jhunnel Sarajan, who shared the photos on his Facebook account. Shortly after the post went viral, Tatay Ryan’s heartbreaking backstory was revealed. Apparently, Tatay Ryan is a street vendor in Juan Luna in Tondo, Manila. His life took a 180 degree turn after he suffered from a mild stroke several years ago. To make matters worse, his wife left him and his two daughters after he fell ill. Moments after learning about Tatay Ryan’s heart wrenching situation, netizens took interest in helping the 38-year-old father. Many offered financial assistance so that Tatay Ryan could also buy his own meal and have more capital for a livelihood that could support his family’s needs. After receiving tons of messages from good samaritans and interviewing Tatay Ryan’s family, Sarajan decided to detail the needs of the selfless father in a Facebook post. According to Sarajan, Tatay Ryan would be needing medical assistance, livelihood assistance as well as educational assistance for his daughters.